SAMS is a Scottish-American Veterans Society of the U.S. Armed Forces and British Commonwealth Services also open to U.S. Active Duty, Reserve, and National Guard Armed Forces personnel, and senior college ROTC members. We honor both our Scottish heritage and the many sacrifices the military have given our country. Through your military service you have demonstrated the character we all value. We will be honored to have you along side of us as we keep alive and celebrate, both the present and our honored past. Please accept our invitation to join us as a member of SAMS and Hawaiian Post 808. Here are links to the SAMS National Membership Application for your use. 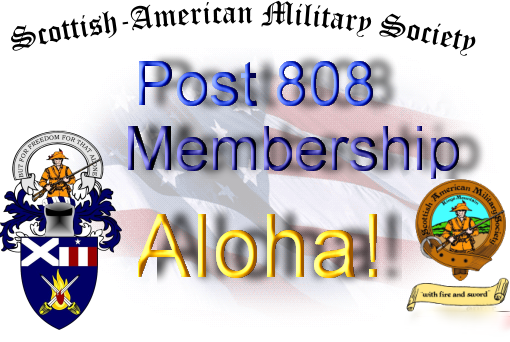 Upon membership acceptance in the National Organization you will also be eligible to join Hawaiian Post 808. We would like to express our heartfelt thanks for your service to our country. We are looking forward to seeing you at one or more of the various SAMS events in the future. If you have any questions, please do not hesitate to contact the webmaster below and he will forward your inquiry to the appropriate person.